Travel Safe...Our Campervans have no sign writing! Family owned and operated fleet of 300 campervans for hire in Auckland and Christchurch, New Zealand. 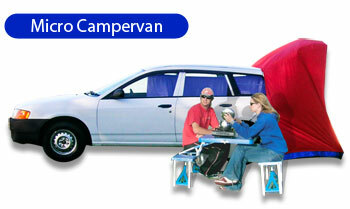 Two models available, Micro Campervan and Economy Campervan. Prices include unlimited km, 24 hour roadside assistance and standard insurance. There are no hidden costs. We provide budget campervan hire and backpacker car rental in Christchurch and Auckland, New Zealand. Our Auckland location is located about 2 kilometers from Auckland Airport. 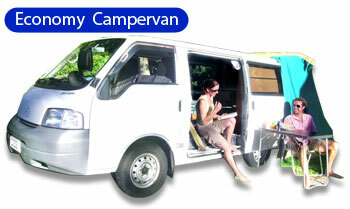 It's only 5 minutes to travel from airport to rent a campervan in Auckland New Zealand. Micro campervan for two people. Sleep inside with the awning attached, or with all doors closed. Economy campervan features day sofa which converts to double bed or two single beds, storage cabinet, folding table and two gas cookers. All campervans contain 240 volt power connection for holiday parks, hanging light, mosquito net, water container, kitchen utensils. Awning fits over rear door providing standing room.